Record Suspensions can be completed by individuals without the assistance of a lawyer or any other agency. Record Suspension Application Booklets, Revised March 2012 may be picked up at any of the Chatham-Kent Police Service Centers. Please refer to Records Management Unit main page for addresses. The booklet may also be downloaded from the Parole Board of Canada website at http://pbc-clcc.gc.ca/prdons/servic-eng.shtml. Fingerprinting for obtaining a copy of record may be taken at Headquarters at 24 Third Street in Chatham, 8:30am and 3:30pm Monday thru Friday. Normally your fingerprints can be done shortly after you arrive, however, due to unforeseen circumstances effecting workload in the Unit you may have a longer wait, or may be asked to return at a later date. There is a fee of $65.00 and two pieces of valid government issued identification must be presented. One piece must have a photo. When your fingerprints are received back from the R.C.M.P. the Local Police Records Check in the Record Suspension Application Booklet must be taken to every police agency where the applicant has lived in the past 5 years. In Chatham-Kent this form must be brought to headquarters between their hours of operation with two pieces of valid government issued identification. Our fee is $50.00 for this service. 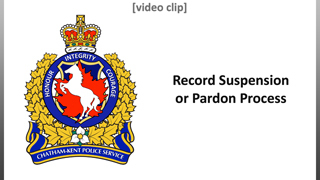 If it has been five (5) years (summary offence) or ten (10) years (indictable offence), since you completed your last sentence and all fines, surcharges, costs, restitution and compensation orders have been paid, you may apply to the Parole Board of Canada for a record suspension. Everything you’ll need to know is included in a booklet put out by the Parole Board of Canada, which is available, free of charge from the Records office of any police agency. You do not need a lawyer or representative to apply for a Record Suspension. This will not accelerate the review of your applications or convey a special status on it. The Parole Board of Canada treats all applications in the same way. You can apply for a Record Suspension by following the step-by-step instructions and submitting your completed application forms to the Parole Board of Canada with a $631 processing fee made payable to the Receiver General for Canada.